My 3rd Great Grandmother Renata Meseck was a German lady that married Ferdinand Ortmann. They were parents of my 2nd Great Grandmother, Minna Ortmann Loepp. 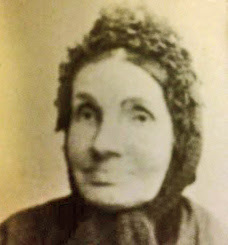 My grandmother, Renata, was born, 18 March 1821 and died 15 September 1901. The book about her life included some of the meals that the family enjoyed. None of those are familiar in anyway and I look forward to my son-in-law that served his mission in Germany to translate some of the interesting facts that are contained in the small book that I'm blessed have about so many of my ancestors lives. I can only think that what I'm writing now in my journal/blog is somewhat similar to what she left for her family. Recipes, hobbies, and daily life. Hobbies weren't probably really hobbies, but necessities. Crocheting may have been a hard duty. I love the linen and crochet bedspread that her daughter made and sent to her niece, who was my great grandmother that I knew, Grandma Martha Marie (Loepp) McKean. The only "Channeling" I did was look for a connection in my family history ... and because I'm one of those Americans that have many different national lines through-out Europe, I knew I had a dear German ancestor somewhere. Voila, I mean ...heir ist, my pancakes. Ta Da! I really want to use our chicken's bounty during this hot weather so here's the easiest breakfast I've ever made and it's going to be used for many meals. 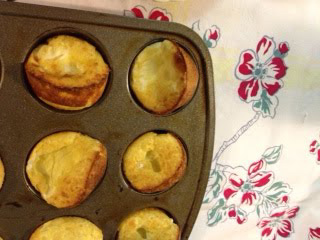 It tastes very similar to a custard with a little crust and is fast without sugar. 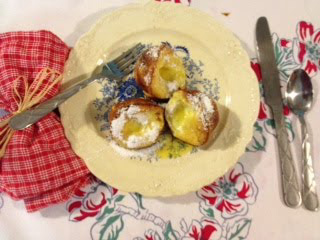 I topped my serving with a tiny sprinkle of powdered sugar and some good butter tasting "Smart Beat." I love how they raised-up and tasted so good. The ones that were in a colder part of my oven I placed back in. I was a bit discouraged because they fell flat on the counter, but as soon as the oven closed the little pancakes raised back-up and when they were done, stayed all puffy and cute. The pancakes are more egg than anything else and I know quite a few families that have these during special occasions. Perfect for big crowds because they are soooo easy to make. 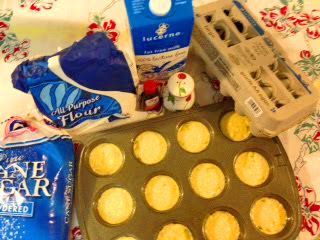 We always have Grandma Loepp McKean's Eggie Pancakes, and they are exactly like crepes, even yummier. The puff pancakes were used at dinner in the early 1800s without the sugar and maybe with any meal, then on the other hand, I can think that my family probably used lots of berries, cooked sugared apples, or lemon flavored pudding for pie. I could make this wonderful little pancake one of the most versatile foods for company, treats, grandchildren, and a whole lot better than a big steak dinner. I wanted to make something a little different for my mother's breakfasts. Seems I hit the jackpot with her too! Yay! Wonderful Pancakes. Glad I'm German Today!